22 ROOF COATINGS 2016 COATINGSPROMAG.COM while higher flow proportioners use 20,400 watt (20.4 kw) heaters. 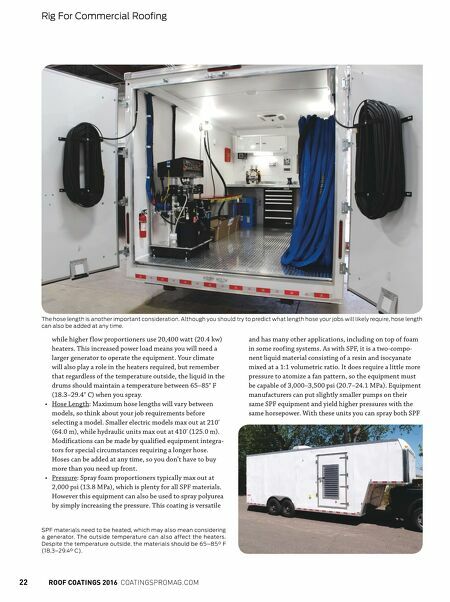 This increased power load means you will need a larger generator to operate the equipment. Your climate will also play a role in the heaters required, but remember that regardless of the temperature outside, the liquid in the drums should maintain a temperature between 65–85° F (18.3–29.4° C) when you spray. 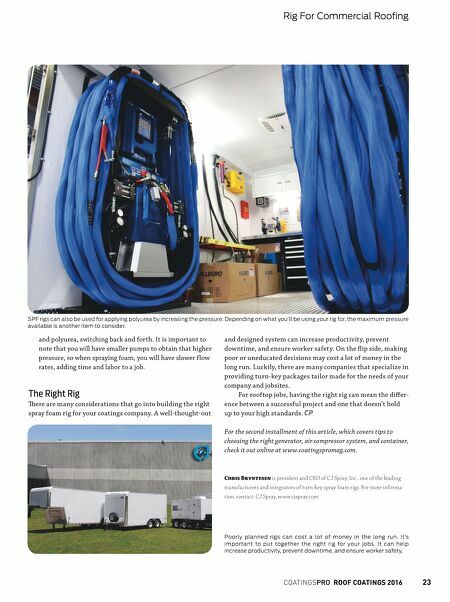 • Hose Length: Maximum hose lengths will vary between models, so think about your job requirements before selecting a model. Smaller electric models max out at 210' (64.0 m), while hydraulic units max out at 410' (125.0 m). Modifications can be made by qualified equipment integra- tors for special circumstances requiring a longer hose. Hoses can be added at any time, so you don't have to buy more than you need up front. • Pressure: Spray foam proportioners typically max out at 2,000 psi (13.8 MPa), which is plenty for all SPF materials. However this equipment can also be used to spray polyurea by simply increasing the pressure. This coating is versatile and has many other applications, including on top of foam in some roofing systems. As with SPF, it is a two-compo- nent liquid material consisting of a resin and isocyanate mixed at a 1:1 volumetric ratio. It does require a little more pressure to atomize a fan pattern, so the equipment must be capable of 3,000–3,500 psi (20.7–24.1 MPa). Equipment manufacturers can put slightly smaller pumps on their same SPF equipment and yield higher pressures with the same horsepower. With these units you can spray both SPF The hose length is another important consideration. Although you should try to predict what length hose your jobs will likely require, hose length can also be added at any time. Rig For Commercial Roofing SPF materials need to be heated, which may also mean considering a generator. The outside temperature can also affect the heaters. Despite the temperature outside, the materials should be 65–85° F (18.3–29.4° C).